First of all, let me introduce myself. I'm a DotA2 portuguese player, huge fan of Warcraft III and Frozen Throne, but only start to play DotA2 less than a year ago. This is my first guide! I thought a lot about it and finally decided to go to my best hero: Rigwarl, the Bristleback! I usually play as a support, but when i had the chance ( in public games is rare to find teammates who support gladly) i go for Bristleback. Also, and since english it's not my native language, feel free to report some bad mispelling you may find. Rigwarl, the BristleBack , is a tanky melee hero. Expert on delivering damage and getting away with it, and there's nothing you can do. He is pretty efficient solo laning, laning with a suport or tri-laning. Never played it mid nor jungle. Guess it depents a lot on your team and the opposite one, but while i can imagine Bristleback jungling, i don't believe it can work at mid. So to conclude, this guide is basically pointed to Top or Bottom lanes. The 2 Iron Branch's grants you good early stats, and you can rush a Magic Wand with it. Tango is basic survivability and the Ring of Protection gives you +2 armor, which is always good since i don't get any shield. Well, i used to start always with a Stout Shield then going to a Vanguard later on. Then i started to trade Vanguard for a much more affordable Poor Man's Shield. Recently, after seeing Purge on youtube playing Bristleback i stopped going to a shield solution and started to go directly to Blade Mail. Why? 3. Vitality Booster will cost all of your Quills!! 5. Blade Mail + Bristleback... "say no more, say no more!" The Early Ring of Basilius provides the extra mana um need to spamm Quill Spray, and later on can be turned into a Vladmir's Offering. When going to Power Treads i usually start with Boots of Speed. Going Gloves of Haste or Belt of Strength depends on how the match is going. If you are harrassing go for gloves, if you're being harassed, belt is preferable. I like to think that Bristleback is a Carry support for other carriers, this is, he's a much team player than most of carriers. This said, the buff from Vladmir's Offering and Assault Cuirass is always a nice thing to get. Depending on your team supporters, Drum of Endurance should be considered if nobody does it. Heart of Tarrasque is kinda mandatory on Bristleback, but Reaver can be hard to farm. Also, Radiance depends much if things are going well to you. Note: in early game you may include Orb of Venom to your weaponry. The 12% slowing and the extra 12 damage ( 3 damage per second up to 4) can grant you some early kills. Quill Spray is Bristleback bread and butter, no wonder you should maximize it first. On the other end Viscous Nasal Goo or Bristleback depends if you're controlling your lane or if you're under control. If you planning on ganking a lot, maximize Viscous Nasal Goo instead of Bristleback. Get your Warpath whenever you had the chance ( this is, at level 6, 11 and 16). Then get stats. Remember: Your passive doesn't trigger your Ulti, so if you are running don't forget to Quill Spray to run faster and... turn your predator into prey :) Myself had some kills this way "Oh those greedy bastards..."
Remember 2:You're skills Stack's. Don't forget to "nasaling" fleeing enemies over and over to see them sticking to the ground. Most for sure it will be one of your team mates to get the kill, but... hey it's a team game!! After building this guide, i've been playing a lot with Bristleback. Statistically i haven't lost any of my 20 games with him. ( I guess it's a good statistic ). Now, if you took a look at Build #4, you can see that is a little different from the other ones. This is the build that i'm using these days and as i told, i've been 100% victorious with it. Depending a lot on your team that's a fact, but usually my games dont take longer then the 30minutes mark. Lot's of kills, but specially, lots of assistances. Sage's Mask it's the major diference here. I've been realize that mana is in fact the most precious need early game to Bristleback, since it allows you to spamm your Quill Spray and get both extra farm and harass. Then you can buy early game a Ring of Protection for Ring of Basilius. Well, not much to say here. Boots of Speed + Magic Wand + Ring of Basilius are easy to get, specially because you already start with part of the recipe. The more i play Bristleback, the more i'm convinced that there's no need for any kind of shield. I try to rush a Blade Mail, starting with a Chainmail since i abdicate a shield. Since i already have a Basilius, i always get a Vladmir's Offering from there. Not only helps you stay longer in battle, but your team mates too. Oh, Power Treads ALWAYS ON RED!! ... its Radiance. By now, you're kicking more *ss than Chuck Norris himself! You can also go Assault Cuirass, starting with the Hyperstone. It's Aura give your team a boost during fights. Didn't mentioned, but you will buy Town Portal Scroll's like crazy, to stay always near the action! "Now this¦this is proper smart!" 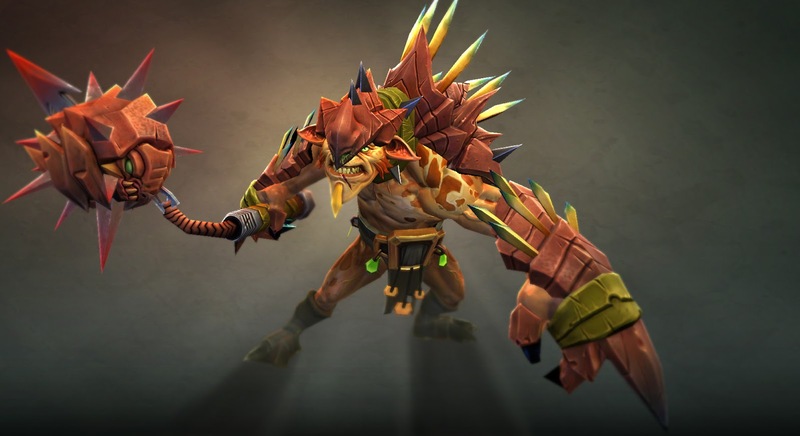 Huskar signature's Life Break and Riki's Backstab are "easy peasy" for Bristleback. Just turn your back on them and pop up Blademail and "Yeah, that chinned ya, didn't it?". "Send me quills, to me mum." Berserker's Call force you facing to Axe, losing this way your Bristleback advantage. Nyx Assassin and Anti-Mage dry's your mana out, later game it may not be a major problem due to your increased mana pool, but early stages it will be "itchy"!! Recently I've been facing some troubles against Legion Commander and Pugna. Duel's can be a pain in your quills, since it forces you to face Legion Commander and also silences you, so forget Quill Spray or even Blade Mail. Pugna's Nether Ward can prevent you from spam quills or viscous. Crystal Maiden's Arcane Aura will be very useful early game, but eventually you will need to ask, since usually who plays Crystal Maiden goes for her Q and W skills first. Chakra from Keeper of the Light can do the trick also. Lane with him. Any support who heals you and keep you in lane, is a truly friend, but from all this miraculous healers, Bristleback must stand up and applaud for Treant Protector. His Living Armor not only is global ( which can permit you solo lanning), but it also add damage block. Bristleback is a very straightforward to play hero. He really is easy to play, but a little harder to master. He really doesn't have that much "natural enemies" and can be boosted by manny heroes ( supporters or not). Because he's tanky with a good Int Grow you're main concern should be increasing DPS stats.